The Grant Park Music Festival recalls the Viennese waltz craze with tonight's program, which doesn't start until 9 PM. In the Pritzker Pavillion, free. For more information, visit the website. Andrew Lampert, curator for the legendary Anthology Film Archives in New York (well, legendary if you're a film fanatic), shows up tonight at Chicago Filmmakers to present his "Unessential Cinema" program of seldom-seen film footage from the Archives' vaults. Chicago Filmmakers' description of the program says to expect "double projections, multiple gauges, home movies, optical soundtracks, unexplainable imagery and much, much more." Sounds like a fun time for film fans! The screening begins tonight at 8:00 PM; tickets are $8, $7 for students, and $4 for Chicago Filmmakers members. 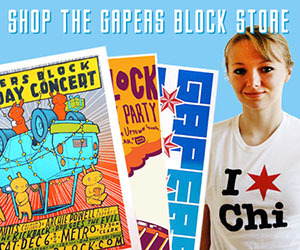 See the Chicago Filmmakers Website for complete information. Chicago Filmmakers: 5243 N. Clark. (773) 293-1447. Sacred Art, the Roscoe Village store that sells art from local artists, hosts its second art show tonight from 7:00 PM to 9:00 PM. Free drinks, lively conversation, and lots of purchasable artwork. Sacred Art: 2040 W. Roscoe. (773) 404-8790. 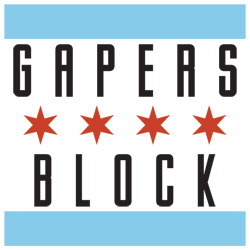 Come hang with members of the Gapers Block staff at our monthly GB Get-Together! This month, we're at Happy Village, 1059 N Wolcott Ave. in Ukranian Village, from 9pm till midnight-ish. Look for us in the beer garden, unless it's raining. Live Action Cartoonists present Performance of Sleep in One Long Act With No Intermission at the Storefront Theater (66 E Randolph) June 30-July 30. Performers draw murals, play basketball, interrogate a panda, and vivisect vegetables, all in the hopes of understanding the metaphorical relationship between sleep and death. Tickets to the performance, which begins this evening at 7:30pm, are $15. For more information call 312-742-8497 or visit the website. The 14th annual African/Carribean International Festival of Life, a celebration of cuisine and music from all over the world, is underway in Washington Park, at the corner of 55th Street and Cottage Grove. 10 AM to 10 PM; $10 for adults, $5 for children. Today's concerts include Jackie Brown and Specialist. Looking for something to do after critical mass on Friday? Pedal that bike over to Darkroom at 2210 W. Chicago for some yummy brit-pop. It's PANIC! time again. DJs will spin British classics from Blur, the Smiths, Depeche Mode, etc. from 9 p.m. to 2 a.m. The 2006 Taste of Chicago kicks off today in Grant Park. 10 days of food, entertainment, cooking lessons, and loads of people. Come by and sample the food from dozens of local restaurants, from Robinson's #1 Ribs to Star of Siam. See the Taste Website for full details.